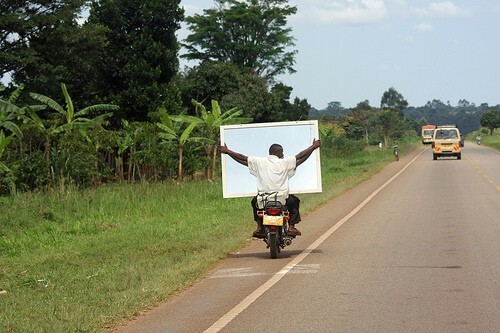 Dave was the first driving instructor to introduce the interactive white board to motorcycle training. It was Jim's first attempt at getting elected, but he just didn't quite get the hang of canvassing. "Damn, that side-wind almost blew me off the bike, Ken.....Ken?" "Hum-chica-ha-chicka-hum-chicka-ha... Do you know where we are yet?" This bloke took stopping bugs getting in his teeth to the extreme. Worlds first solar powered scooter. "God, I could do with a shave!" For the Narcisistic Mod in your life. At the crossroads take a right Turner. Always remember to adjust your rear view mirror before driving. There's no blind spot on MY rear view mirror. I wanted a windshield. I got one. Dev's mystery motorbike tour was not a great success.